Angelos Sofocleous in Philosophy & Religion on 3 June, 2018. John Cage’s 4’33’’ can be described as one of the most controversial, alternative and challenging pieces of music in history. In fact, its controversial nature revolves around the case that its very position as a ‘piece of music’ has been challenged. This is because, in 4’33’’, musicians are ordered to play…nothing. The orchestra is silent throughout the whole piece. ‘How is silence a piece of music?’ you may ask. But the piece is not about silence, I argue, although it is usually taken as such. It’s about sound. I am not going to argue that 4’33” is a piece of music, and I am very skeptical as to whether it can be regarded as such. However, I find that 4’33” is a unique piece of art in that it achieves an expansion no piece of art has achieved before. Throughout a music piece, let’s say Beethoven’s 9th symphony, any sound that is not included in the score, be it a cough when you’re listening to the symphony at Philharmonie de Paris, or the sound of your kettle when you’re listening to the symphony on YouTube at home, counts as ambient sound not included in the piece of music. Although I will not expand on this further, I agree that the definition of an ‘ambient sound’ being ‘any sound that is not included in the score’ is restrictive as a wrong note played by a musician (i.e. a note not included in the score) will still count as part of the piece. In fact, a musician not playing or wrongly playing a note in the piece will still produce (or not produce) a sound which is part of Beethoven’s 9th symphony, albeit a Beethoven’s 9th symphony wrongly played. However, for the purposes of this article, I will assume that a music piece is played as ordered in the score. Ambient sound, then, is not attended to and is marginalized. This not only happens when a music score is performed but also in our everyday lives. What John Cage attempted to do, then, with 4’33’’ is make us attend to these ambient sounds that take place in our everyday lives and give them the same stance as pieces of music are given. This is not to say, however, that Beethoven’s 9th symphony has the same value as the sound of cars’ engines annoyingly passing outside my window, but it allows us to see that both are pieces of sound that share some qualities and both have aesthetic value. That is, they can get louder and quieter, faster and slower, have high peaks and low peaks. 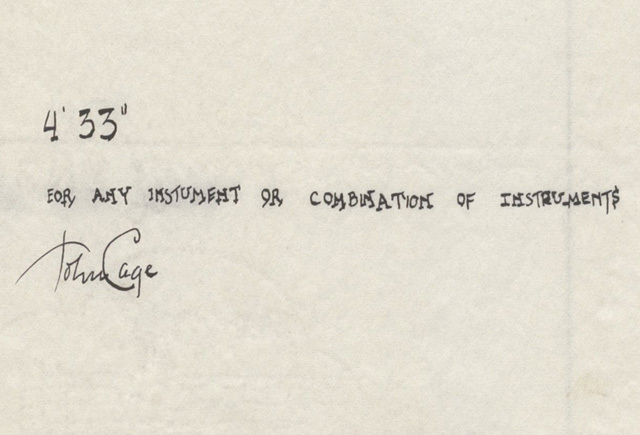 “I love sounds, and I love them as they are”, Cage said. We think that if one instrument stops playing that it ‘produces’ silence, but it is never silence for there are always sounds around us. The sounds that John Cage probably wishes to make us attend to are the ‘damned’ sounds, those who are always seen as interrupting something. The sound of scratching, for example, would be seen as interrupting a piece of music, but as interrupting silence as well. However, there might be some art in it too. Cage’s greatest accomplishment, however, I argue, is the concept of expansion that 4’33’’ achieves, something that only a piece of its kind could achieve. Any piece of music, from the moment it includes sounds played by the orchestra, becomes extremely restrictive to the orchestra itself. Any sound not produced by the orchestra and any sound not included in the score (with minor exceptions, as above noted) does not count as music. The piece of music, then, is limited to the orchestra itself. That is, what is produced does not go beyond the physical limits of the orchestra, nor does it escape time. It does not matter whether Beethoven’s 9th symphony is played by musicians at home without an audience, or at Philharmonie de Paris, or if you’re listening to a recording of it on YouTube, or if it’s played on Sibelius, or in 1918, or in 2018 – it is the exact same collection of sounds. Beethoven’s 9th symphony is only what is produced by the orchestra itself. The audience is not part of its production. Marcel Duchamp would comment on this by saying that “music is not time art, but space art”. I would argue that in the case of Beethoven’s 9th symphony, it is neither. It is not a piece of art that has to do with time or space, as it is shown by the fact that it cannot be influenced by time and space, as it is the same collection of sounds regardless of the time and space in which it is produced. 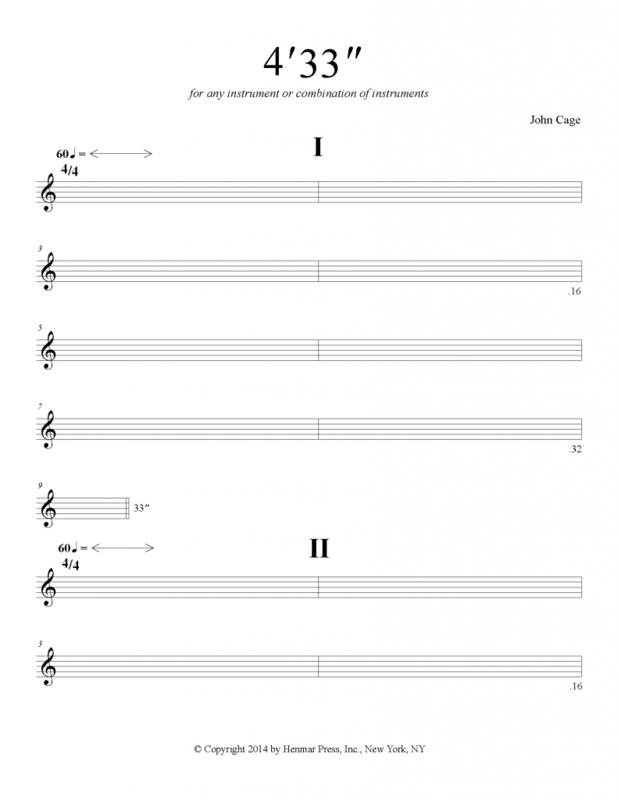 On the other hand, John Cage’s 4’33’’ is a piece of art that has to do with time and space. That is, 4’33’’ is not restricted to the physical limits of the orchestra itself but expands to wherever the listener is – the listeners and their environment become part of the piece. This expansion is what I find most astounding about the piece. Each listener experiences the piece in a different way in the sense that they listen to and attend to different sounds in the environment to which they belong. There is no specific place in which 4’33” is actually performed. However, in the case of Beethoven’s 9th symphony, all listeners receive the exact same input. There is no doubt they process it in different ways, but the primary source is exactly the same for every listener. 4’33’’ then manages to expand to the time and space in which the listener exists and allows the listener to engage in the piece in a way that no other piece can. If we imagine that they are both live streamed around the world; when Beethoven’s 9th symphony is played, all audiences will listen to the exact same thing. What is produced is restricted in the physical limits of the orchestra. In John Cage’s 4’33’’, however, what is produced goes beyond the physical limits of the orchestra and it wouldn’t be an overstatement to say that it is physically unlimited, and this is what makes it a unique piece. I find the notion of expansion that 4’33’’ achieves as astonishing and this is what I wanted to stress in this article. However, I am still skeptical on whether 4’33’’ is a piece of music. There seems to be more in music than the random, unstructured, and unorganized sounds we hear every day. There is a price we would pay if we readily classified 4’33” as music. What would happen when a piece of sound art, such as reciting poetry, joined John Cage’s 4’33’’? Would reciting Edgar Allan Poe’s ‘The Raven’ during 4’33’’ be regarded as music? I don’t think so, and it would be a major insult to do so.